Sarah Palin recently unveiled a crown based hair bump. It’s definitely a unique retro hairstyle which adds new flair to her previously sleek appearance. Although volume infused hairstyles were wildly popular in the 1950s and 60s, the hairstyle has remained popular in some areas and with certain age groups. For 2012 expect retro hairstyles utilizing teasing for volume, increased body and texture to be more popular than ever before. There are many ways to achieve a hair bump ranging from a variety of hair clips or hair accessories to clip-in hair pieces and good old 60s style backcombing. Of course you can combine old fashioned backcombing with hair clips or bands to achieve a very nice hair bump at any point on your head. 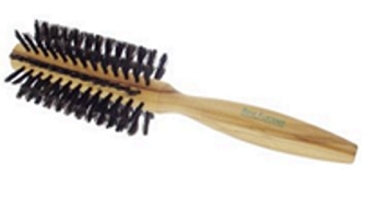 The best way to backcomb hair to achieve the smoothest finish is to use a 100% boar bristle teasing brush. 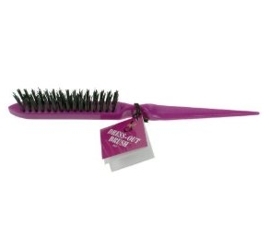 A teasing brush is specifically designed and manufactured for use for teasing or backcombing hair. The brush area on a teasing brush is usually much more narrow than on a traditional styling brush. 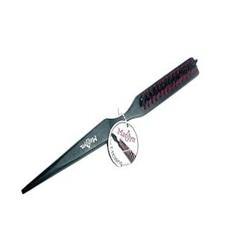 Teasing brushes are designed to be used on very small amounts of hair at a time. 1. They are the best tool for creating volume and lift in long heavy hair. 2. Teasing brushes are small, but work quickly and easily to create lots of volume from the roots to the middle of the strand. 3. A teasing brush creates a much smoother finish than a traditional rat tail teasing comb which leaves a more ragged finish. 4. 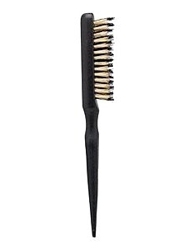 Teasing brushes are ideal for fine, thin or overly soft hair. 5. A great teasing brush costs less than $10. 6. Great for spot backcombing on sassy ponytails, volume infused twists of tousled buns. 7. Perfect for retro 50s and 60s hairstyles such as bouffants or beehives. 8. Will create volume on just about any length of hairstyle from super short to very long. 9. Can be used on any part of the hair from the top of the head to the sides or back. 10. 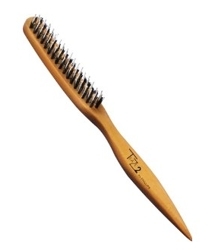 A teasing brush is ideal for hair which is more prone to damage from a comb. 11. Great for fine or thinning hair. 12. Creates soft lift as well as smoothing frizzy pieces. 13. Bristles of brush are less likely to pull or snap hair because of the bristle size. 14. 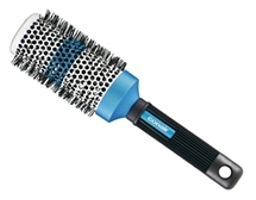 This type of brush makes it easier to get all little hairs to stay together for a well teased effortless result. 15. Can work on all hair textures from curly and wavy to coily. 16. Teasing brushes tend to do more teasing in less time with less hair breakage. While it’s possible to use a regular boar bristle styling or small paddle brush for backcombing large sections of hair at one time, for small sections or for exaggerated volume a backcombing brush is ideal. Depending upon the manufacturer, teasing brushes will have plain or textured handle for a firmer or more comfortable grip. Teasing brushes may also sometimes have a tapered tip or a few longer bristles for easier separation of the hair during back combing. Teasing or back combing hair should never be performed every day since it may create damage over time. The best approach is to divide and conquer. Before you start figure out what areas of your hair you want to backcomb for the most volume. Separate the target hair into very small sections. Make sure that each section has been pre-straightened and is completely free of tangles. Each target section is brushed from the end of the strand down to the roots in quick sharp brushing bursts. By brushing hair from the ends to the roots you are actually brushing hair in the opposite direction you would normally brush hair in. Normal brushing involves brushing from the roots to the ends. Volume and body are created by brushing up from the ends which ruffles the cuticle. Once the desired volume and lift is achieved, use fingers to gently brush and shape the section so that it is smooth. Finish with a blast of firm hold hair spray or related styling products. The goal is to ensure the teased section will hold its shape and body for as long as possible. Repeat the teasing or back combing process with each section of hair until the entire area or all of the hair is properly volumized. Best Hair Brush And Hair Brushing Tips Hairstyle Myth Of 100 Brush Strokes Hair Tangled In A Brush Angelina Jolie’s Red Carpet Hairstyle – Premiere of “Inglourious Basterds” Brush Up On Your Beauty With Branded J Collection! This entry was posted on Friday, January 6th, 2012 at 8:33 pm	and is filed under Hair. You can follow any responses to this entry through the RSS 2.0 feed. Both comments and pings are currently closed.